Maki Onishi. Born 1983. Graduated from the Kyoto University Undergraduate School of Architecture and completed the doctoral program at the University of Tokyo Graduate School of Engineering. Taught as a guest professor at Kyoto Seika University and as a special guest professor at the Nagoya University of Arts in 2013. Has been teaching as an adjunct lecturer at Yokohama National University and Hosei University since 2013. Yuki Hyakuda. Born 1982. Graduated from the Kyoto University Undergraduate School of Architecture and completed the doctoral program at the Kyoto University Graduate School of Engineering. Worked at Toyo Ito & Associates, Architects from 2009 to 2014. 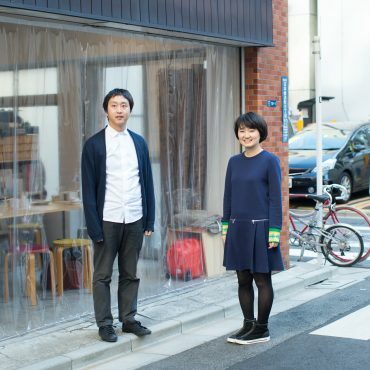 Onishi and Hyakuda have been the co-directors of onishimaki+hyakudayuki architects / o+h since 2008. They have been engaged in a wide variety of activities centered on architectural design, including installations and community-building projects. Their representative projects include the Double-Helix House (2011) and Home-for-All for Children in Higashi-Matsushima (2013). They have received numerous awards, including the 2007 SD Review Kajima Award and 2012 Yoshioka Award. This is the second entry on the Window Bookcase Project. We at the Window Research Institute asked o+h, the architectural practice of Maki Onishi and Yuki Hyakuda, to produce a furniture piece that can be used for holding a traveling exhibition of books in small bookstores and galleries across the country. The concept for the piece is “a bookcase like a small building”. o+h present their ideas for the design in this entry. Onishi: Today we will be showing our ideas through models. These are still in the making, but they are the two schemes that we are designing: the folding screen scheme, which unfolds to define spaces, and the building scheme. This project started when we commissioned o+h, the young wife-and-husband team of architects Maki Onishi and Yuki Hyakuda, to design a bookcase for us. This is the first article in a series of entries that will be documenting the making of the bookcase until its completion. Please make a bookcase like a small building…! In 2007, we at the Window Research Institute initiated our Windowology studies, a research program focused on windows that is grounded in our philosophy: “The window is a product of civilization. Windows embody culture.” We have now published five books domestically and three books overseas as products of our research. The section for architecture books where these books are shelved in bookstores is generally considered to be an area full of serious books on engineering. This impression that people hold of it as a very academic section has stood as an obstacle to our wish to have many people read our books. We need to devise something that will make people from children to adults want to pick up our books. But who would be the best partner for us to work with to give shape to this project? After careful consideration, we have commissioned the project to o+h, the architectural practice of Maki Onishi and Yuki Hyakuda.